AZNAVOUR uses cellulose acetate and is primarily made of plant material. Cellulose is a material that was used before plastic was developed. It was made by solidifying ingredients extracted from plants, not petroleum. It has been widely used for making accessories and glasses frames that are in contact with the skin for a long time, but it has recently made a big appearance in cosmetics. In addition, cellulose acetate has a luxurious touch and a beautiful color, which adds to luxury and style. 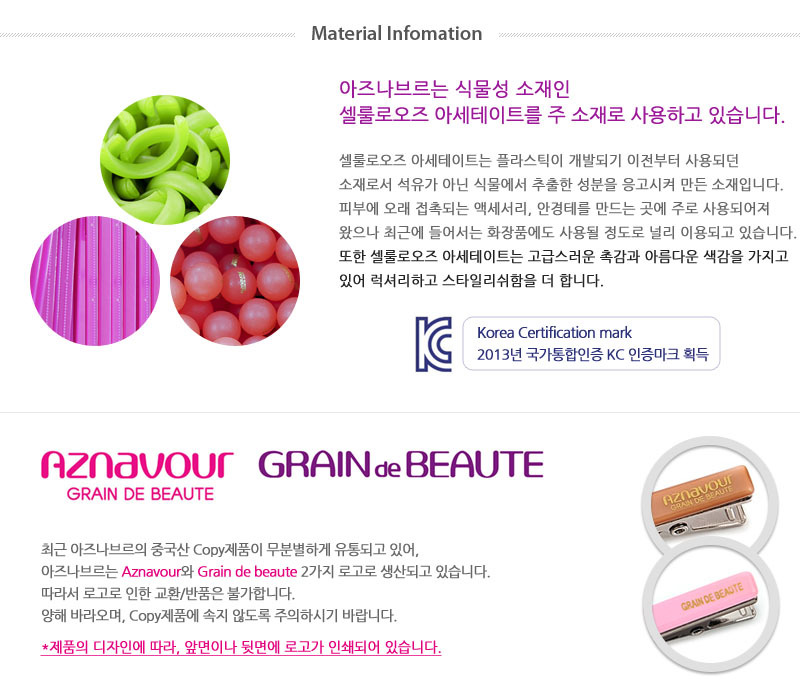 AZNAVOUR and Grain de Beaute have been used as two logos since Aznavour's Chinese-made COPY products have been spreading all over. Therefore, exchange / return due to the logo is not possible. Please be careful not to be deceived by the copy product. * Depending on the design of the product, the logo is engraved on the front and back of the product.